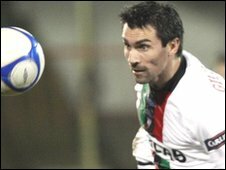 Keith Gillespie is leaving Glentoran after the former Northern Ireland winger and the club failed to agree terms on a new deal. The 35-year-old exits the Oval despite indicating that he was prepared to take a pay cut at the cash-strapped club. "Following discussions with Keith Gillespie the club have been unable to agree terms and the player is now a free agent," said Glentoran. Gillespie, who won 86 international caps, joined the Glens last year. Gary Hamilton, Daryl Fordyce and Shane McCabe remain on the transfer list. The original total was five but Andy Waterworth and Richard Clarke were taken off the list last weekend after they approached the club to take a pay cut. Michael Halliday, Kyle Neill and Dean Fitzgerald were released after they were not offered new contracts. Former Manchester United and Newcastle United player Gillespie was with Bradford City before joining Glentoran in a one-year deal. Gillespie also played for Blackburn Rovers, Leicester City and Sheffield United, plus loans spells with Wigan Athletic and Charlton Athletic. "The club thanks Keith for his professionalism and the example he set to younger players and wish him every success in whatever he chooses to do going forward," added Glentoran in a statement.